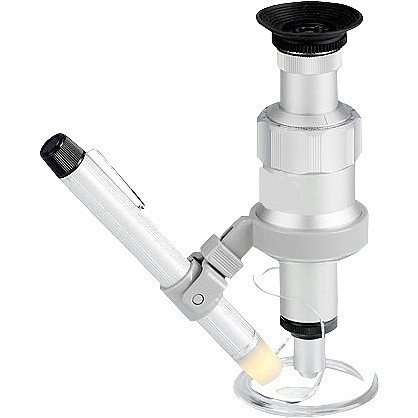 Providing you the best range of 100x Shopfloor Microscope with Scale LC 0.01mm, 10x-30mm Magnifier Loupe with Scale, 10x-26mm Handle Magnifier with Scale, Magnifying Headset 2.5x With Interchangeable Lens, Pocket Microscope 60x-100x With LED and 3x-75mm 45x-22mm Bifocal Handle Magnifier with effective & timely delivery. The measurement scale is made of glass and has a graduation 0.1 mm with a measuring length of 30 mm. The housing contains a ring consisting of 8 LEDs (and 4 x AG9 batteries), which provide bright, high-contrast illumination of the entire measuring field. The conflict between high resolution and wide field of view was able to be fully resolved in this product making it a most efficient inspection loupe. 1. ABS Plastic body + optical acrylic lens durable for use. Use this magnifier for examining biological and geological specimens in the field and laboratory. A polished optical lens is mounted in a plated metal rim which is threaded in a black plastic handle. It is a must-have for many science classes and labs.